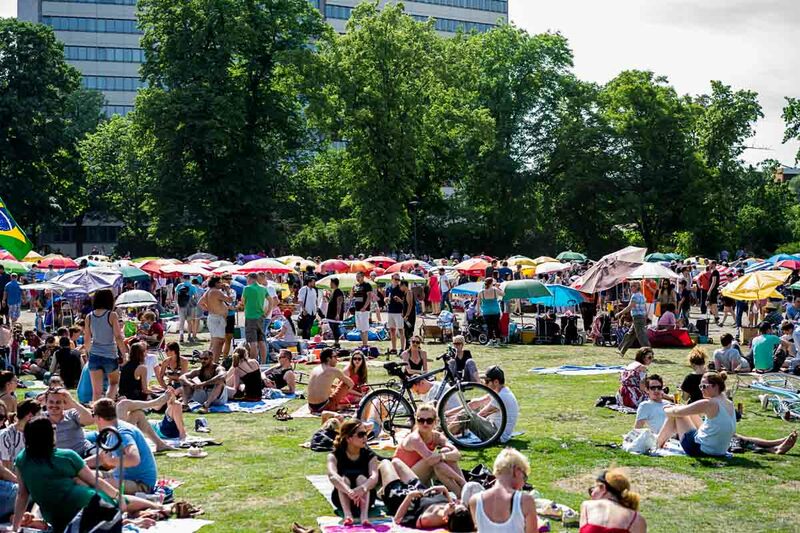 The story of the Thai Park is a truly extraordinary and fascinating Berlin tale. A truly unique tale that really only could play out this way in the republic’s capital. 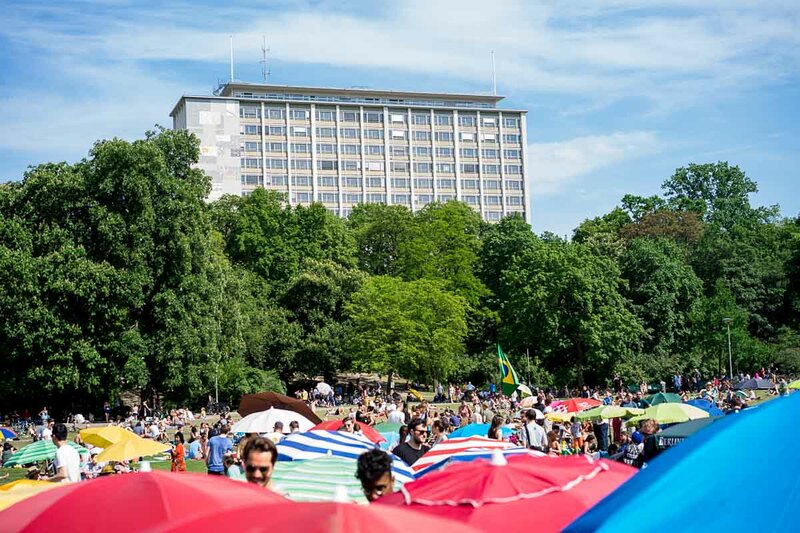 In the most unassuming part of the West Berlin district Wilmersdorf you will find an tiny little park that goes by the name of “Preußenpark”. And if it wouldn’t be for one little, reoccurring happening, not many Berliners would ever make it out to this little speck of green. But this park is no ordinary park. You will know this park by a different name: Thai Park. 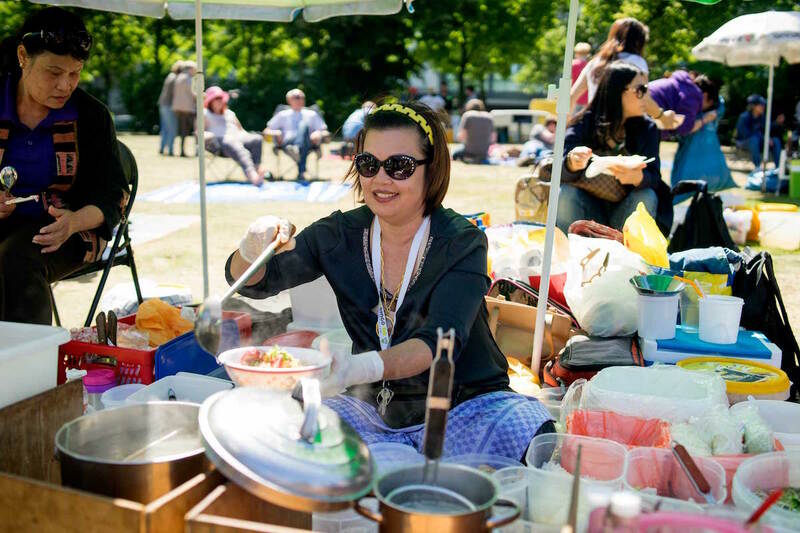 For over 20 years the Berlin Thai community have been congregating in this park on weekends to hang out, cook, eat and celebrate Thai food culture. The story goes that eventually hungry park visitors started asking the Thai families if they could buy some of their food and that this sparked the business mind of the families. 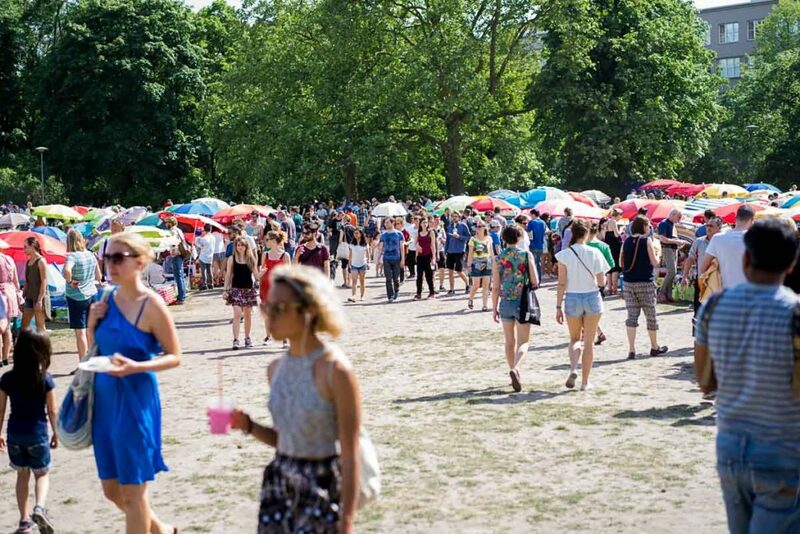 Word got around and eventually it developed into the Asian street food fest we today know as the Thai Park (or the Thai Wiese, as some Germans like to call it). The unofficial opening of the Thai Park nowadays marks the true beginning of the Berlin summer. Screw daylight savings and calendars, it’s when the eminent ladies of the Thai Park start congregating at Preußenpark that you know the Berlin summer is here to stay. You could argue that everything has been said and written about the Thai Park, but sitting on my blanket the other week, watching people getting in line at the wrong vendors and buying the wrong food, I realized that’s not true. Far from all the food at the park is great and the increased offering of food in the last years has not necessarily increased general quality. Dear fellow eaters, behold the one and only food guide to Berlin’s most extraordinary street food market. Check the bottom of the article for a detailed map with the most important vendors. 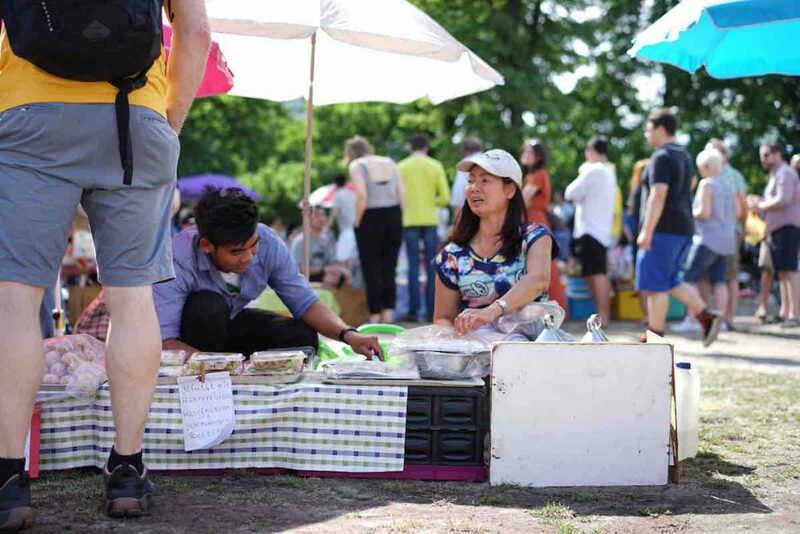 Now, the good thing about the Thai Park is that the important vendors always occupy the same spots. This makes navigation fairly easy. 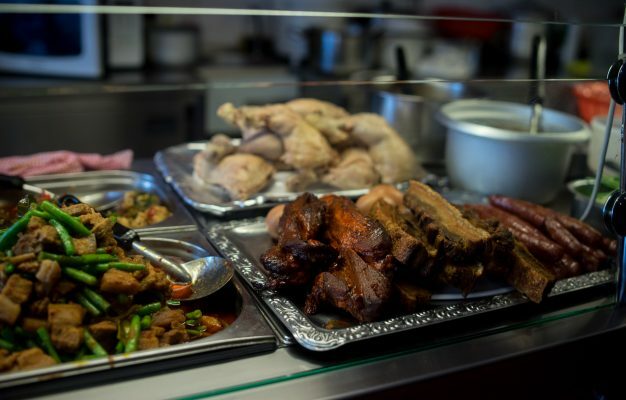 There are a couple of things you shouldn’t eat at the Thai Park. I have for example never had a great Pad Thai here and the same goes for Thai curries. My general recommendation is to skip those dishes all together. Lately there have also been a lot of new vendors coming out to sell Korean and Chinese dumplings, but they have, without exception, been very average in terms of quality. 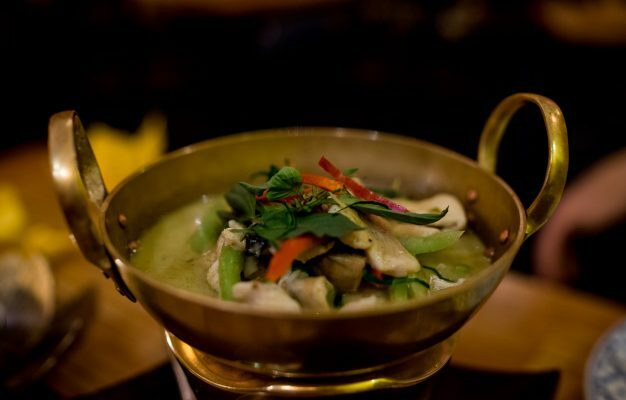 The general rule of thumb at the Thai Park is to buy dishes that are made from scratch a la minute for you, meaning that you should refrain from buying things that have been sitting out in the open for a while. 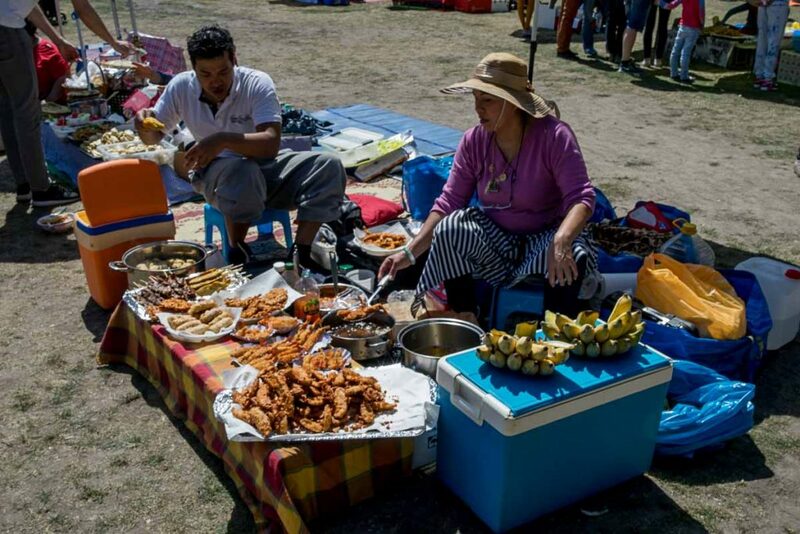 One good example are the deep fried items, don’t buy any of the stuff sitting out on display, do instead look for vendors who are in the actual process of deep frying and wait for them to finish. Best fried food are hands down the sublime Kluay Kaek (banana fritters), slices of banana deep fried in batter and sprinkled with sesame. A fresh batch of these will brighten up any day. If you manage to snag a fresh portion of fried fish or crab you’ll also be ok, but they need to be fresh. There are multiple vendors offering fried food and they are all of similar quality. 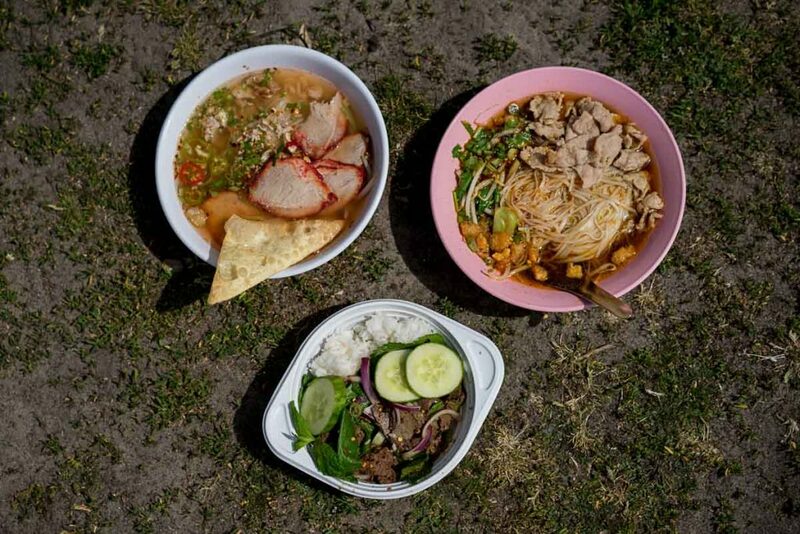 One of the best things you can eat at the Thai Park are the noodle soups and there are only two versions that are great. One of them is the Soup Lady in the Northern corner who makes a terrific beef noodle soup with thin slices of pork that’s slightly sweet and delicious. 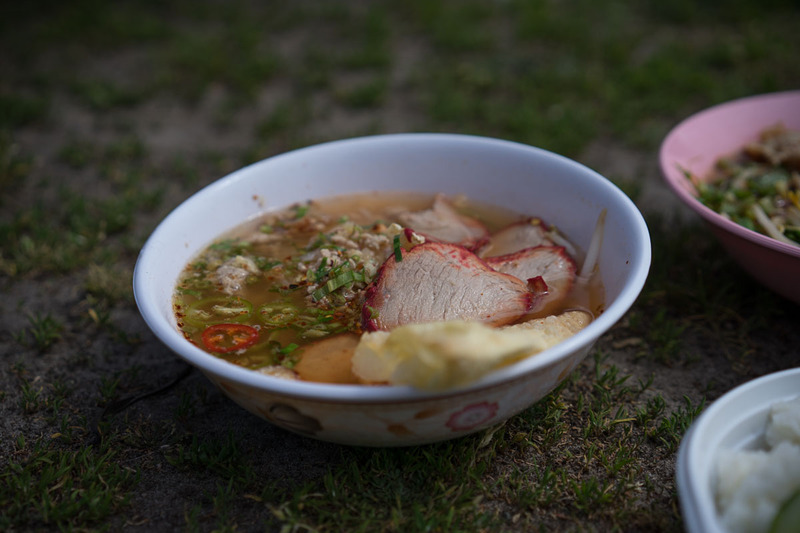 But in terms of quality it doesn’t come close to the famous Pork Noodle Soup Lady in the Western corner. You’ll recognize her by her extraordinary mise en place setup with over 30 different containers of ingredients lined up around her to assemble her amazing noodle soups. She offers two versions, a seafood version and a pork char siu red pork version. I highly recommend the pork one, it is one of the main reasons I keep coming back to the Thai park and always the very first thing I go to buy at the park. 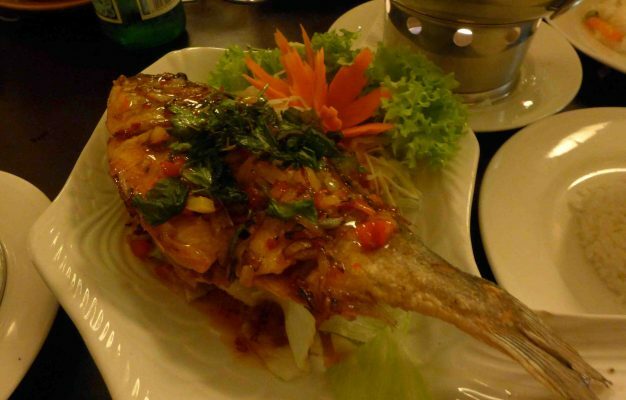 The unique mix of sweet, sour and savoury explodes on your palate in terms of both flavours and textures. Highly recommended and in my opinion one of the best noodle soups in Berlin. Right across from the pork noodle soup lady, in the next isle, you will find another, very special vendor selling Saku Sai Moo, tiny, translucent tapioca dumplings filled with ground pork and peanuts. Be sure to secure a box of these sweet and savoury spheres before they sell out, because they are spectacular. 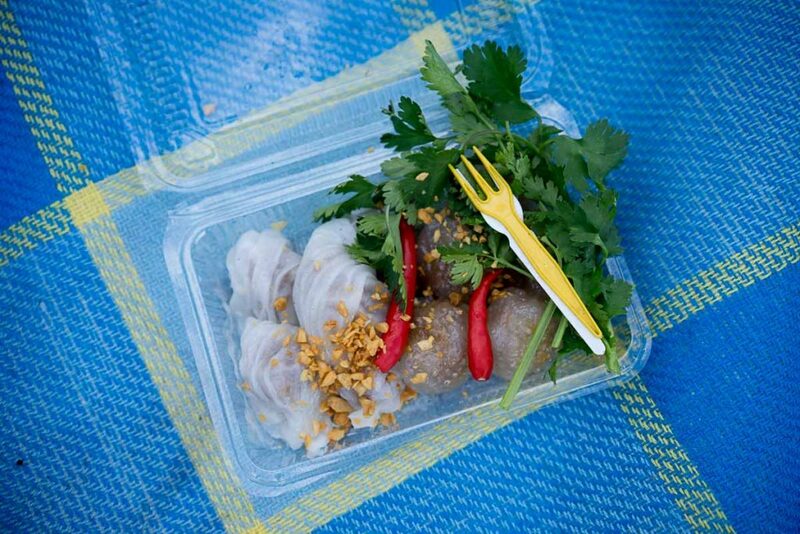 The right way to eat these is to take a bite of the accompanying coriander and one of the chili buds before you devour one of these sweet and savoury taste bombs in the same bite. A Thai park classic is the Som Tam (papaya salad) and while the salads in the park won’t have the same quality as the ones you can get at restaurants like Papaya or Sammaki Talad Thai, the lady in the North Western corner whips up a pretty mean and spicy version in front of your eyes. Another lady that’s also great is the one in the Eastern centre, easily recognized by the long line of people waiting for her to whip up a salad in her giant mortar. Once you’re done with the savoury food, use Papaya Salad Lady #1 to navigate to the most amazing dessert vendor at the Thai Park, located just to her right. You’ll recognize the Dessert Lady by the banana leaf-wrapped snacks she has on display alongside a stack of precious Thai mangos. My advice is to order all her things, the Khao Tom Mud (banana sticky rice in a banana leaf) is fantastic and so is the sticky rice with custard in banana leafs. 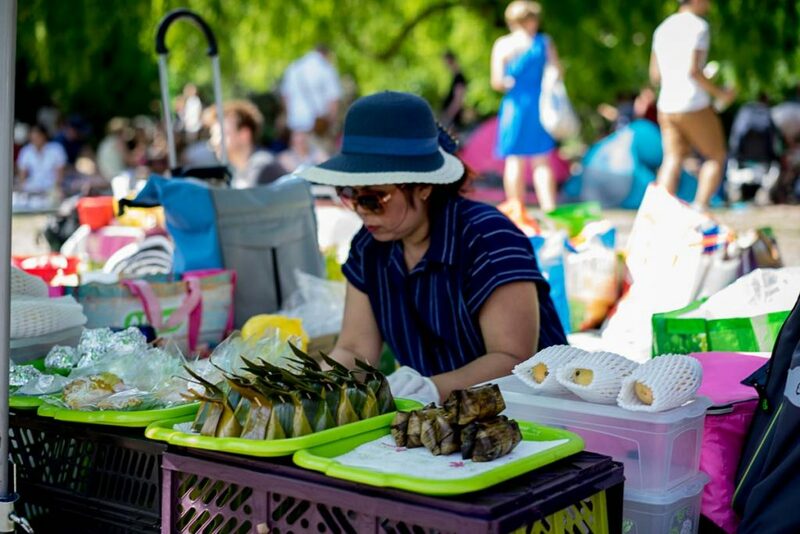 But the real reason you should go to this lady is her Khao Neow Ma Muang (sticky rice with mango), a dish that’s become increasingly popular and available at the Thai Park over the years. The big problem with most vendors is that they pre-pack this dish into containers and leave it to sit. Most vendors also use crap quality mangos. Not this lady, she cuts her insanely sweet Thai mangos for you upon order and carefully assembles it with two kinds of sticky rice and coconut milk. The quality of her stuff is second to none and the last thing I always do before I leave the park is to get a box of this heavenly treat to take home and bring out at home in front of the TV. The Thai Park is a unique and beautiful manifestation of food culture and while the park was a well kept secret for decades, it definitely no longer is. 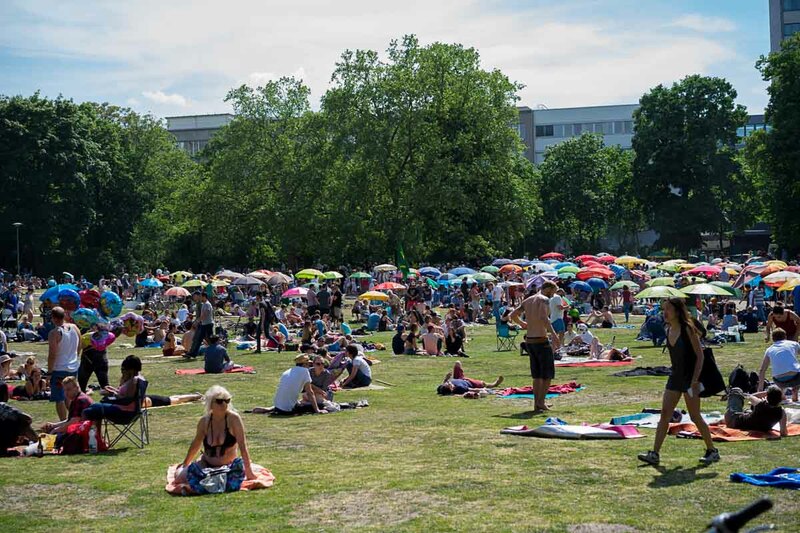 Along with the explosive media attention, the last years have brought a massive onslaught of visitors from all across Berlin, which eventually devour every straw of grass in the park and turn the whole park into one dusty dirt pile. The reason the Thai Park has been able to operate as it has, is really due to the very understanding nature of the district authorities throughout all these years (someone here deserves a medal by the way). 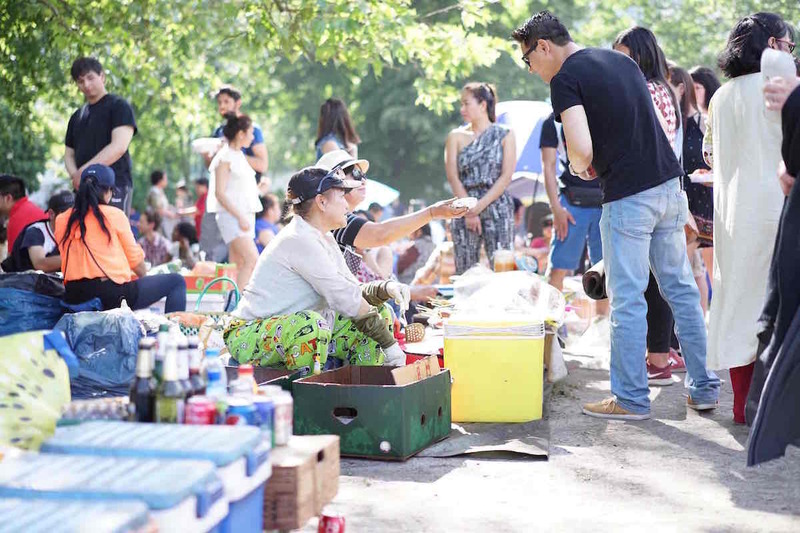 With the massive attention and negative side effects on the park and plenty of other looming problems, the question has always been how long the Thai Park will be able to survive in its current fashion. 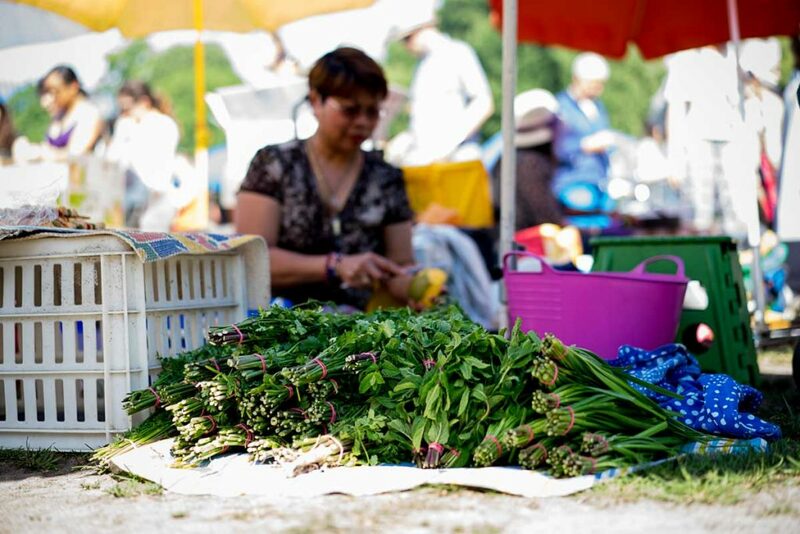 I truly hope that the market survives, because by now the incredible Thai Park belongs to the culinary heritage of Berlin and the closing of it would be a tremendous loss for all of us. Please support the Thai Park by being a caring and nice guest. Pick up your trash, use the toilets and just be nice. And if you’re a vendor or authority reading this, facing problems concerning the survival of the park, please reach out to me if I can help to support and preserve the park!